When your goalie is saving everything it clouds the effectiveness of the process. We are also only a few days removed from Mike Sullivan talking up the Johnson-Pettersson pairing. I'm fine with Pettersson going up with Letang for right now. I want to find out more about him away from Jack Johnson to see what the Penguins actually have him in. We already know everything there is to know about Dumoulin-Letang. They can always go right back to it. However, I want to learn some more about Brian Dumoulin. He was caved in with Ron Hainsey. I imagine it will be the same with Jack Johnson. I would be more interested in seeing Dumoulin with Maatta until Schultz is back. 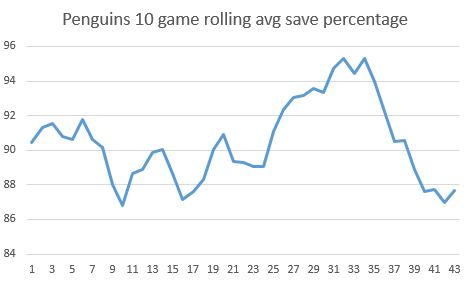 When Schultz is back I want to see how Dumoulin does with him. If that is a good pairing then Olli Maatta and Pettersson can duke it out to see who gets to play on the top pairing. Hopefully one of them can blend in. Now you have a decent top four and a horrific bottom pairing. It is a lot easier to fix a bottom pairing than the top four via trade.